White House Correspondents' Dinner weekend is D.C.'s annual time to shine. Hollywood let's us borrow some of our favorite A-List celebrities and the city is brimming with parties and overall jubilation. Whether you've scored a seat at the sure-to-be hilarious dinner with host Joel McHale or will be celebrating at one of the exclusive after-parties, that LBD that you've worn to death is just not going to fly. 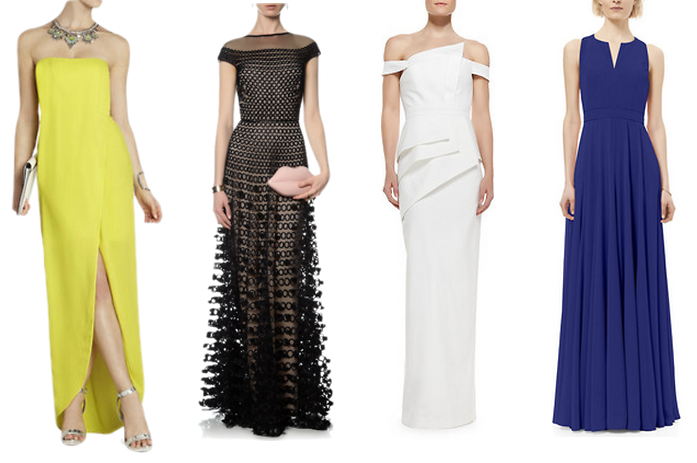 We're rounded up a selection of evening gowns that will stand out in the crowds while still maintaing a level of class for schmoozing with the elite of DC's political and media crowd. (Read: No sequin, cut-out dresses that leave little to the imagination. Sorry, pageant queens!) Shop these stunning frocks and maybe you'll even steal a spot on our coveted Best Dressed Guest list!